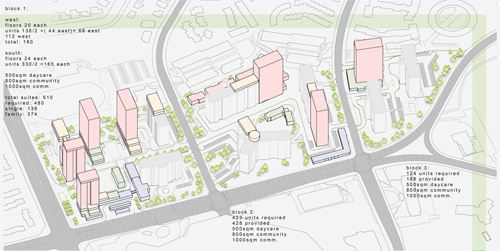 This Option Studio focused on a site at Sheppard and Don Mills, typical of Toronto’s inner suburbs, with its distinctive clusters of high-rise residential buildings erected in the period of the 1950’s through the 1970’s. 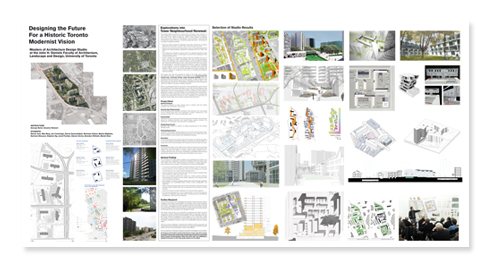 The goal of this studio was to investigate the potential of apartment tower sites to emerge as more liveable and sustainable communities, with a specific emphasis on built form. For more information on the site please see our previous post on the studio. 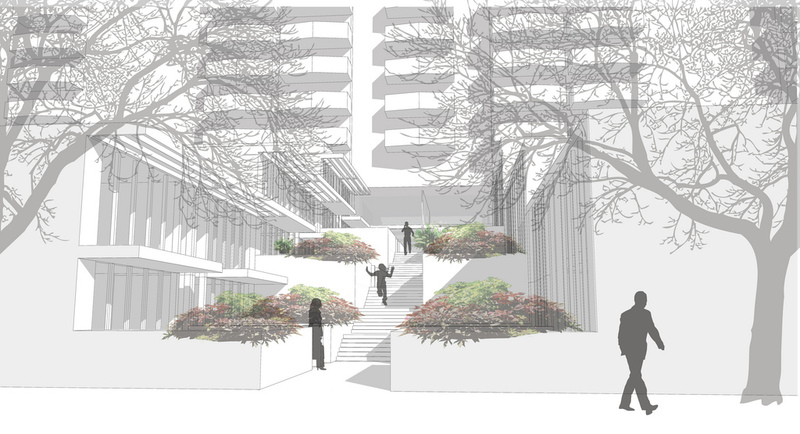 The studio operated under the assumption that existing buildings on site would be retrofit in accordance with previous tower renewal propositions. As such the focus of the studio shifted to re-conceptualizations of site planning, and to the design of new buildings erected on site, thereby increasing both the population density and availability of services and amenities. The project brief was ambitious in calling for the addition of over 1000 new housing units, as well as increased community services, shops and family amenities within the existing property boundaries.  Scheme proposed by Brendan Whitsitt. Scheme proposed by Stephen Ng. Scheme proposed by Mahsa Majidian. Of the housing accommodation provided in each scheme, 70% were asked to be of family sized units of two bedrooms or larger. Furthermore, of all housing provided, 25% was to be affordable units. 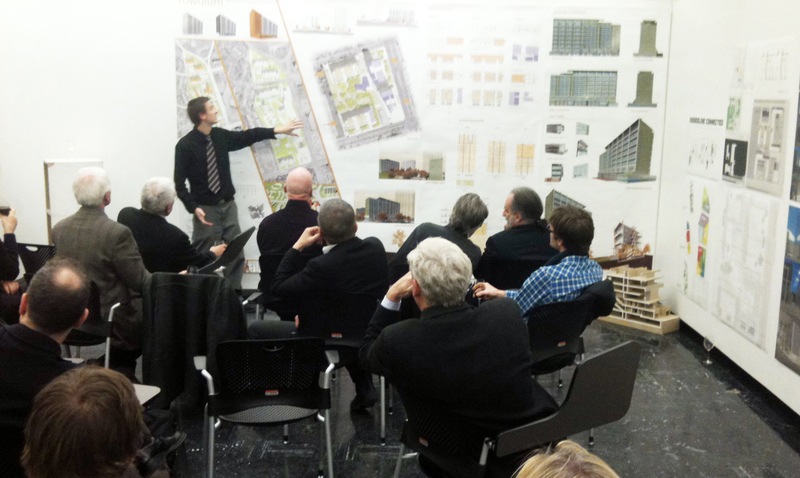 Added to these stipulations, emphasis was placed on meeting the building code’s requirements, addressing parking and site access, meeting a high level of sustainable design, integrating with rapid transit, and developing a clear hierarchy of public and private spaces with connections from the site to the neighbourhood at large. all schemes addressed the current fragmentation of the site through the provision of integrated open space plans including various combinations of pedestrian, cycle and road networks. The results of the studio correspond with the wide range of findings from various investigations into the potential of post-war tower blocks. As such the studio further confirms these sites as assets with great potential to shape the Toronto region. Scheme proposed by Max Berg. Scheme proposed by Jon Cummings. Scheme proposed by Darius Gumushdjian. and establishing a regulatory framework in which high quality projects can be realized. 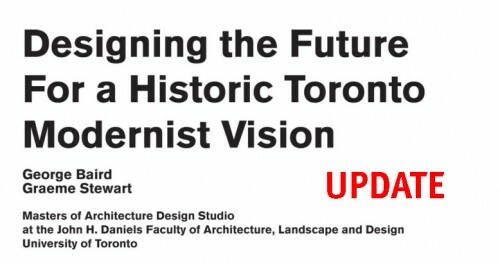 For more information of the studio and its result, please download the Summary Presentation Board, presented at the second Tower Neighbourbood Renewal Symposium held at the University of Toronto in May, 2011. Masters students at the Daniels Faculty of Architecture, Landscape and Design at the University of Toronto included: Steven Avis, Max Berg, Jon Cummings, Darius Gumushdjian, Nicholas Hoban, Mahsa Majidian, Nariman Mousavi, Stephen Ng, Jared Pumber, Steven Socha, Brendan Whitsitt, and Mendi Zhen.